To quote from the greatest film of our generation, Rudy, when Rudy's father walks into the stadium at Notre Dame for the first time, "this is the most beautiful sight these eyes have ever seen." 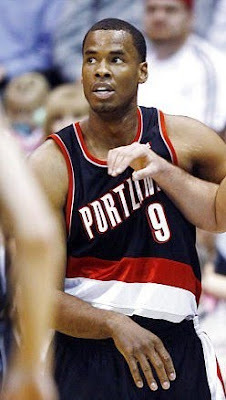 This is how I feel when I look at the photo above; Jarron Collins in a jersey which is not the jersey of the Utah Jazz. Did Collins go on the Memo Okur offseason diet this summer? He did. Nothing but lamb shanks and Turkish Delight. Rumor has it that Collins is being cut by Portland today. The Suns are interested.